Letip Santa Cruz was established in 1990. The first meeting took place in what is now the Holiday Inn on Ocean Street. 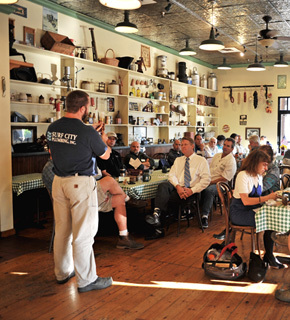 Many local business owners could see the need and benefit of a networking group in the area and many people joined. Within a short few months the group grew to over 70 members and it became clear that in order to allow more people to benefit through the participation, it would be beneficial to split up into four groups based on the geographical locations – Santa Cruz, Capitola, Aptos and Watsonville. Over the years, the business professional of the Santa Cruz chapter had met in the El Palomar Restaurant, Hollin’s House Restaurant, Chaminade Resort, and currently the meetings take place at Erik’s DeliCafé on Soquel Drive. Today LeTip Santa Cruz is 40-people strong. We have a great camaraderie and most members mention frequently that Thursday morning, when we hold our meetings, is their favorite time of the week. We all look forward to meeting with fellow business owners and know we can rely on each other’s integrity, work ethics and ability to deliver professional services. Letip Santa Cruz is one of the largest, profitable and long-standing chapters in the area.